All Gorman homes currently listed for sale in Gorman as of 04/26/2019 are shown below. You can change the search criteria at any time by pressing the 'Change Search' button below. "Enjoy this 177 acre, 2 parcel (46 acre + 131 acre), ranch property with a once in a lifetime investment opportunity! This property features 2 country style homes and 1 spectacular barn including 6 stalls for horses. The main home has 1,600sq ft. of comfortable living space, 1 master bedroom with 1 master bathroom, two 3/4 baths with 2 showers/toilets, a spacious kitchen, open floor-plan with an impressive 2,400sq ft. garage/shop that is perfectly suited to store heavy equipment, machinery, or even your car collection. The secondary home, built in 1995 features 1,800sq ft., 4 bedrooms and 2 bathrooms, a big family room equipped with a beautiful fireplace, and a large fenced-in yard. The kitchen includes oak cabinetry, outward facing windows, and is openly integrated into the floorplaPublic utilities include gas, electric, trash, TV, and internet. Water is provided by 3 wells on the property and an oversized septic tank services both homes.The ranch is situated on 177 acres of prime, beautiful CA mountain land. Catch a perfect sunrise in the mornings and enjoy miles and miles of riding trails on flats as well as steeper terrains overlooking the hills. Return back to the Ranch at sunset to enjoy the cool breeze and breathtaking night sky." 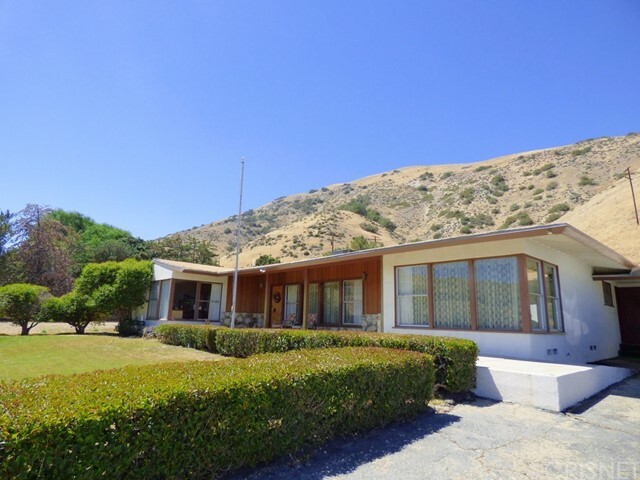 "Elegant 1950 s home on 23 Horse zoned acres overlooking the beautiful Gorman Hills. Over 2500 square feet in this incredibly well-kept 3 bedroom, 3 bath home. Large living room features redwood paneling, solid redwood beams and a cozy brick fireplace. Spectacular views from the adjacent formal dining area. Kitchen includes granite counters with a convenient breezeway to the 2 car garage . Spacious master bedroom with en-suite bathroom boasts a walk-in shower, separate bathtub, large vanity with his and her sinks and its own tankless water heater. The grounds include mature landscaping and 4 lawns with a sprinkler system. Entertainer s back yard with covered patio, built-in BBQ, solar lighting and a basketball court. Award winning Gorman School that serves K-8th grade, two options for High School, Frazier Mountain HS, or Antelope HS. Easy access to I-5 for commuting. This home has been owned by the original family since 1952."